Chevy is going all-out for the 2018 Guangzhou Motor Show, debuting the Chevrolet FNR-CarryAll Concept (three-row Chevy Blazer) and the all-new Chevy Monza. But that’s not all the Detroit automaker brought to the show. 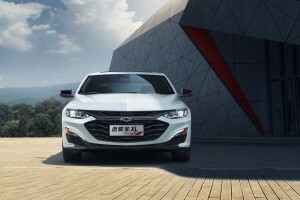 The automaker also unveiled a refreshed Malibu XL and new Malibu XL Redline, which is just the North American Malibu for the Chinese market. Out of the box, both the Malibu XL and Redline sport a turbocharged 2.0-liter engine producing 237 horsepower and 258 pound-feet of torque. The engine pairs with a nine-speed Hydra-Hydra-Matic gearbox. The Redline doesn’t receive any powertrain enhancements over the standard Malibu XL. The new Malibu adopts the same refresh as its North American counterpart. The Redline trim, which joins three other Redline models in China, adds black and red design elements to give it a sportier appearance on the outside. The new double grille on both the standard Malibu XL and XL Redline gives the sedan an aggressive look. New LED taillights add to the car’s visual flair. Inside, the Redline receives a black sports interior and red stitching. Both the XL and XL Redline come equipped with Chevrolet’s MyLink infotainment system and an eight-inch HD touchscreen as standard. OnStar, along with in-car internet access, is available in addition to free over-the-air updates. Baidu CarLife, Apple CarPlay, and smartphone connectivity are also available. The Malibu XL Redline joins the Equinox Redline, Cruze Redline, and Orlando Redline all launched this year. Going forward, nearly all Chevy models sold in China will offer a Redline variant. Chevy made a splash at this year’s 2018 Guangzhou Motor Show. The country is getting an all-new model and a refreshed sedan. And the Chevrolet FNR-CarryAll Concept likely previews a three-row Blazer coming down the pipe shortly in hopes of capturing more of the burgeoning crossover and SUV market in the U.S.